The DM 502 Digital Multimeter measures dc and ac voltage and current, dBm, dBV, resistance and temperature. The ac functions are average responding and RMS calibrated for sine waves. A single front panel control selects all ranges. 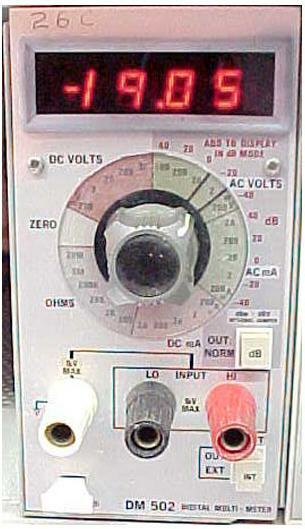 A front-panel pushbutton selects dB readout of ac functions in lieu of voltage or current. Rear interface-connector input is also pushbutton selected from the front panel. Values of dB are obtained by adding the selected dB range value to the display reading. Readout in dBm or dBV is chosen by an internal jumper. The unit is shipped with the jumper in the dBm position. An internal jumper also permits selection of fet input (>1000 MΩ) or 10 MΩ input impedance on the two lowest dc-voltage ranges. The unit is shipped with the jumper in the 10 mΩ position. Temperature measurements are made using a Tektronix P6430 probe or other suitable sensing devices Option 2 instruments delete the temperature measuring capability. The readout is a 3-1/2 digit display using seven-segment LED's. The decimal point is automatically positioned by the range-function switch. Polarity indication is automatic. A usable 50% overrange exists in all measurement modes except ac voltage and current, 1000V dc, and the 1 A dc current range. In overrange, the display blinks and the most significant digit is suppressed. Upon exceeding the available 50% overrange, a 1 appears in the most significant digit position. Display readings are invalid beyond this point. Interlaced bcd output (1,3,2,4) referenced to the low input is available at the rear interface connector if user wired. The maximum input voltage is 1 kV, 350 V at the rear connectors. 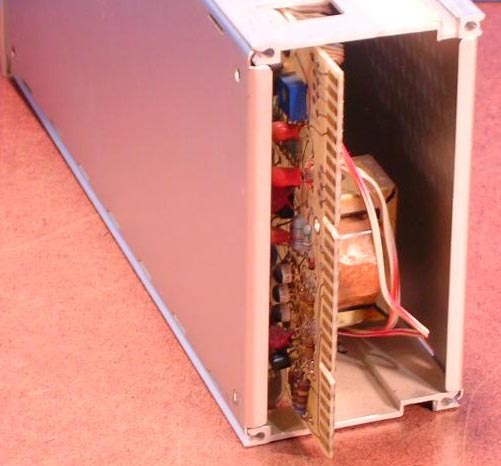 The front-panel HI and LO connectors may be floated 1 kV maximum above ground, the rear inputs 350 V.
Input Resistance 10 MΩ (jumper selectable for >1000 MΩ on 0.2V and 2 V ranges). ±1.0% of reading, ±1 count, 20 Hz to 20 kHz. Three binding posts provide measurement connections. The HI and LO posts are normally used for all measurements except temperature. Normal measurement conditions will be with the LO teminal ungrounded. A connection between the LO and GND posts may be made to reference the input against DM 502 chassis ground. Use caution, as the LO terminal is then connected to earth ground through the three-wire power cord. False readings may be obtained due to ground loops. If the INPUT button is pushed in, signal inputs are made via the rear interface connector; if the button is out, signal inputs are made via the front panel. Select an appropriate full range dc voltage position with the range-function switch. Apply the voltage to be measured to the INPUT binding posts. Observe the maximum voltage ratings as indicated on the front panel. The readout displays a + if the HI input is positive with respect to the LO input. A - is displayed if the LO input is more positive. With the input shorted, the display reads zero, ± one count. Select an appropriate full scale DC mA position on the range-function switch. Appy the dc current to be measured to the INPUT binding posts. A current (electron flow) into the LO connector and out of the HI connector indicates + on the display. For opposite current flow, a - will be displayed. CAUTION To prevent possible damage to switch contacts by high currents, do not switch into, out of, or through the current measurement modes from the other measurement modes with a high current source, or large inductive or capacitive load, connected to the DM 502 input. This caution does not apply to switching between individual current ranges up to the maximum stated input current, as the switch contacts are adequately protected for this operation. Select an appropriate full scale AC VOLTS, AC mA or OHMS position on the range-function switch. Connect the unknown voltage, current or resistance to the INPUT binding posts. To use this feature, switch to an ac voltage or current range and push the button marked dB on the front panel. 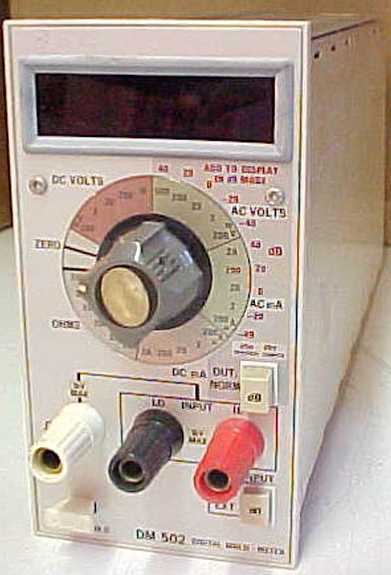 Connect the voltage or current source to the DM 502. To arrive at the correct dB reading, algebraically add the number on the outside scale to the display reading. When the dB switch is depressed, the decimal point is fixed and the maximum display reading is 19.99 on all scales. With the P6430 probe connected to the front panel connector labeled TEMP PROBE, set the range-function switch to the °F or °C in the TEMP position. Apply the probe sensor tip to the device being measured. For optimum temperature transfer, coat the surface of the device being measured with silicone grease and apply the probe tip squarely to the surface, Allow sufficient time for the probe tip to stabilize before taking a reading, The time required depends upon several factors. Generally, when the tip is first applied to the device under test, the readings change rapidly. As the probe tip temperature approaches the temperature of the device under test, the readings change less rapidly, and finally stabilize. The readings are in °C or °F, depending on the position of the range-function switch. Accuracy without recalibration of the DM 502 is within ±8°C to 150°C. If the measurement to be made requires greater accuracy, recalibrate the temperature circuitry or determine a correction factor. Place the sensing device in an environment having a known ambient temperature. Use any difference between the known temperature and the DM 502 readout as a correction factor throughout the entire measurement range. The OHMS positions on the range-function switch provide accurate (typically 0.2%) constant currents at the INPUT terminals. See the Ohmmeter specifications for the value of the currents and maximum voltages across the INPUT terminals for full scale display readings. The maximum voltage available across the INPUT terminals in the OHMS position is about 10 volts. 1- 4 366-1402-27 Pushbutton: "INT"
1- 4 366-1557-19 Pushbutton: "DB"